Main Floor: 1312 sq. ft.
Second Floor: 772 sq. ft.
Total Square Footage: 2084 sq. ft. 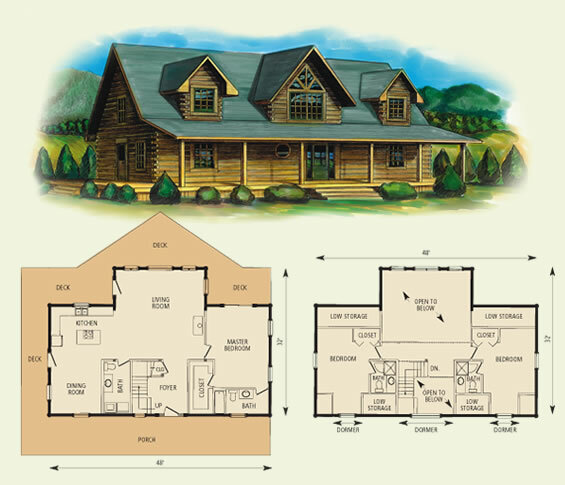 The Fair Oaks log home is a one of our most popular floor plans. This versatile log cabin design is filled with great features including a large two story foyer, beamed cathedral living room ceiling, open kitchen and dining for entertaining, and a main floor bedroom suite. Two additional bedrooms with their own baths make this a plan to consider. With wrap porch and decks for recreation and entertaining, this house plan works great on a site overlooking a lake or mountains.